It was the most influential marriage of the nineteenth century--and one of history' s most enduring love stories. Traditional biographies tell us that Queen Victoria inherited the throne as a naïve teenager, when the British Empire was at the height of its power, and seemed doomed to find failure as a monarch and misery as a woman until she married her German cousin Albert and accepted him as her lord and master. Now renowned chronicler Gillian Gill turns this familiar story on its head, revealing a strong, feisty queen and a brilliant, fragile prince working together to build a family based on support, trust, and fidelity, qualities neither had seen much of as children. The love affair that emerges is far more captivating, complex, and relevant than that depicted in any previous account. The epic relationship began poorly. The cousins first met as teenagers for a few brief, awkward, chaperoned weeks in 1836. At seventeen, charming rather than beautiful, Victoria already "showed signs of wanting her own way." Albert, the boy who had been groomed for her since birth, was chubby, self-absorbed, and showed no interest in girls, let alone this princess. So when they met again in 1839 as queen and presumed prince-consort-to-be, neither had particularly high hopes. But the queen was delighted to discover a grown man, refined, accomplished, and whiskered. "Albert is beautiful!" Victoria wrote, and she proposed just three days later. As Gill reveals, Victoria and Albert entered their marriage longing for intimate companionship, yet each was determined to be the ruler. This dynamic would continue through the years--each spouse, headstrong and impassioned, eager to lead the marriage on his or her own terms. For two decades, Victoria and Albert engaged in a very public contest for dominance. Against all odds, the marriage succeeded, but it was always a work in progress. And in the end, it was Albert's early death that set the Queen free to create the myth of her marriage as a peaceful idyll and her husband as Galahad, pure and perfect. As Gill shows, the marriage of Victoria and Albert was great not because it was perfect but because it was passionate and complicated. 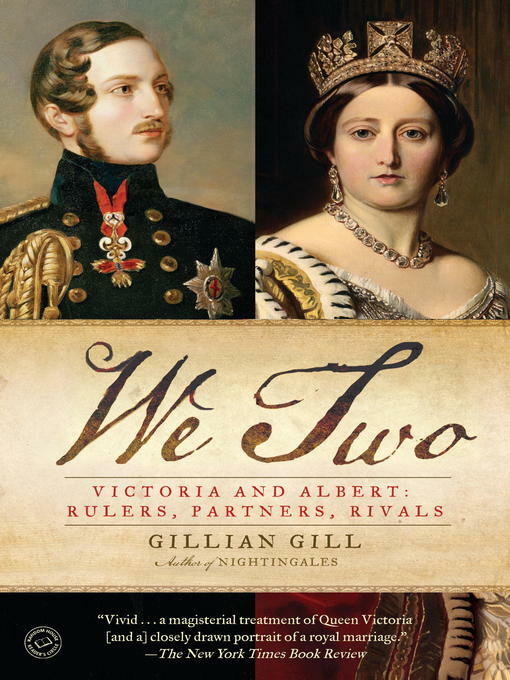 Wonderfully nuanced, surprising, often acerbic--and informed by revealing excerpts from the pair's journals and letters--We Two is a revolutionary portrait of a queen and her prince, a fascinating modern perspective on a couple who have become a legend.